Most nonprofits work on donor acquisition continuously. Can you imagine saying, “we have enough donors!” Probably not. If you’re struggling with donor acquisition, it might be time to reevaluate your strategy and focus on one specific group of people: those you already call contacts. This could mean people that subscribe to your email list, your followers on social media, or connections your organization made at networking events. These people are already familiar with your organization and therefore, already more likely to become a donor. How can you take them from observer to benefactor? We have a few tips to help you help them make the transition. First, decide which of your contacts is most likely to become a donor. Good candidates are people that regularly interact with your organization on social media, event attendees, and people that donate sporadically or have donated in the past. The key to turning contacts into donors is nurturing their relationship with your organization in an authentic way. 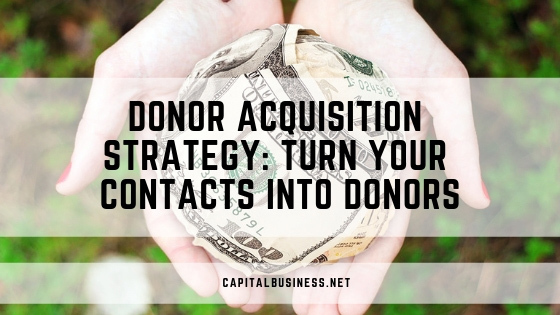 This is an important step in any nonprofit fundraising strategy, but it’s key when turning contacts into donors. Respond and interact with contacts on social media, reach out to them without asking for a donation, make an effort understand why they support your organization, and ensure they know how much you value their support. This allows you to forge a deeper connection while also helping you understand what kind of appeals will, well, appeal to them in the future. People aren’t always able to donate money to your organization, but they still want to show their support, especially if they’re already a contact. Give them the opportunity to support you without spending a dime. Whether that’s sharing posts on social media (make it clear how beneficial this is to a nonprofit! ), volunteering, making something to donate, or donating items they no longer need. Allowing people to donate in non-monetary ways makes it more likely that they will donate monetarily in the future. Part of nurturing your relationships with potential donors, and a very important part of any nonprofit fundraising strategy, is segmenting your email communication. This means dividing your email list into groups based on their interests, demographic, or other factors so they receive emails tailored to their interests. This is especially important if your organization works toward multiple goals. Someone who has expressed interest in supporting a specific mission of your nonprofit may not be interested in donating to your general fund, and vice versa. Make sure that you tailor communications to their interests as best you can. Of course you’ll want to keep track of any donations you receive, but it’s also important to keep track of your interactions with your contacts to see what helped them become donors. Use a spreadsheet or a dedicated CRM (customer relationship management) to house their contact information and track your interactions, their interests, favored social media platforms, when you contacted them, what they responded well to, and any other information that you think could be helpful for donor acquisition in the future. This is an extremely important step in your nonprofit fundraising strategy, but many people neglect to give it the attention it deserves. A “thank you” email is acceptable, if it is authentic and customized to each person. Mass “thank you” emails appear insincere and can turn people off. Better than an email, however, is a handwritten card. It only takes a few minutes to write and send a card, but the impact will be enormous. Abila software can help you simplify the donation process and organize the donations your organization receives. For more information on our nonprofit accounting software solutions, call us at 919-821-1244 or fill out the form below.